"2012 Des Plaines River Trail Races! Race directors Terry Madl and Ed Kelly (both veteran ultra runners) brought their expertise and love of trail-running back to the crushed-limestone of the Des Plaines River Trail, Lake County, Illinois. Runners took advantage of the sunny day with temperatures that hit highs in the upper-50° F range, and lazy fall breezes. Oswaldo Lopez, M, 40 of Madera, California with a time of 6:18:03.8. Tracy Hixon, F, 48 of Chicago, Illinois with a time of 7:48:09.6. Jake Gillette, M, 26 of Goshen, Indiana with a time of 2:47:57.0. Kathleen Schaefer, F, 44 of Valley Forge, Pennsylvania with a time of 3:32:38.6. Derek Berube, M, 30 of Des Plaines, Illinois with a time of 1:17:32.4. Heather Weirath, F, 40 of Chicago, Illinois with a time of 1:30:43.0. Click the "View Photos" tab above to see a gallery of photo images taken at the 2012 Des Plaines River Trail Races. Note: These photos have been optimized for display on the internet... if you'd like a "high-resolution" original contact me and I'll send you a copy. 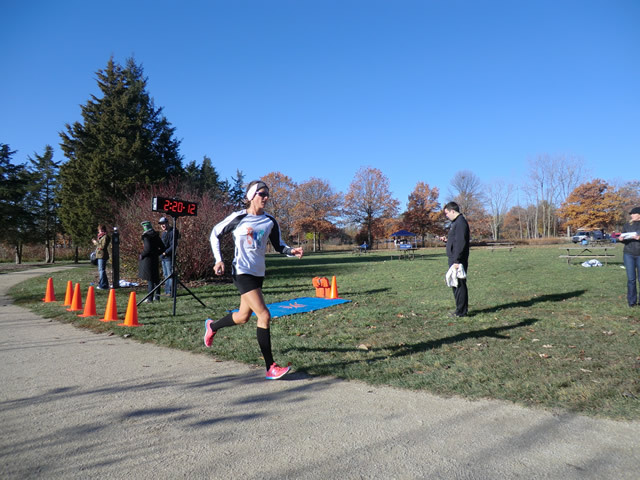 Congratulations to all runners, spectators, and volunteers who took part in the 2012 Des Plaines River Trail Races!